Not really a Miniorgan, but a fantastic programmable musical system. 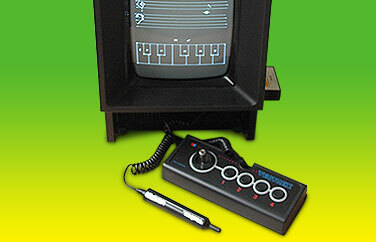 The Vectrex is one of the most famous retrogame machines nowadays. With a special software called Melody Master and a Light Pen you can create your own Drum & Music Sequences on screen. It looks like a Fairlight but sounds like a C-64. Anyway, it is fun to see the musical notes jumping and running on the sreen.